I have two grandsons that just turned 4! They are the cutest little guys ever. Of course we all think that about our kids, grandkids and pets! I have 6 grandkids and now we have added 3 more step-grandkids. I have been trying to make them all a quilt. I only have done 4 so far. The newest granddaughter got a chenille quilt when she was born. If you have never heard of them or done one let me explain. You layer 4 layers of flannel together and stitch straight lines on the diagonal about an 1/2" apart. Then you take and cut through 3 of the layers in-between the lines of quilting to create the chenille. It is very time consuming! I think I will try quilting the channels on a longarm sometime. Sorry I don't have any good pictures of the quilt. I put a minky binding on it and machine finished it as you can see in the picture. I hated it so I ripped it out and hand stitched it! Your probably wondering what about flying geese? 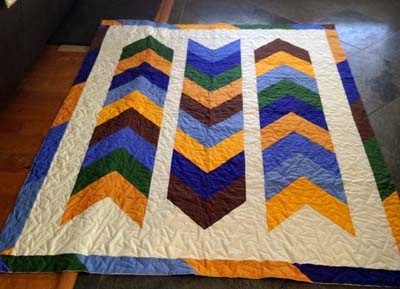 I made these quilts for my grandsons. I wanted large flying geese laid out in a row to form an arrow. These are 6 x 12 flying geese. I used the flying geese ruler to cut them. I think it was much easier that way. I quilted the quilts differently and put a flannel back on both of them with cute little cars on one and trucks on the other. I think I like the circle quilting better but it was a pain to line up each row on the longarm. The last picture was taken before I put the binding on. I really need to use my camera to take pictures instead of my phone. The top picture was taken with my camera. I think it looks much better! 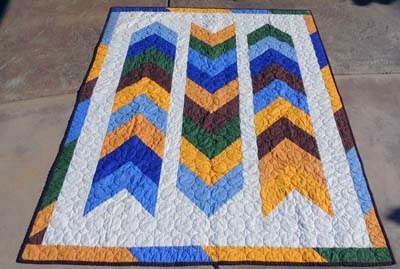 I think if I have time I will make a pattern for this quilt and put it on the blog.